“The days are long but the years are short,” is a popular saying among parents. The problem with this statement is that it’s totally true. The years will fly by and before you know it your baby will be headed off to college. Have you saved enough? Have you saved at all? With the rising costs of education, saving for college seems like an impossible task for many parents. But if you think about it right for the start and plan for those costs, you may be able to help pay for some of your child’s schooling or even all of it. My husband and I decided a long time ago that we wanted to try and pay for college for both our kids. His parents were able to pay for his schooling. I had student loans and here I am almost 20 years later still paying for my undergrad degree. As I’ve looked more options to help us make this a reality, I’ve uncovered that there are actually a lot of ways to save. I’ve grouped these together below along with some advice. The most basic way to save, and the way my husband and I have so far been saving for college, is a savings account. We add money to it on a regular basis and are keeping our fingers crossed this will be helpful when it’s time for our kids to head off to school. A basic rule I’ve found is that you want to save about $2,000 a year to be able to pay for some of your child’s schooling. However, we realize that we have to bump up our efforts here so there are other ways we are considering saving for their futures. Most employers offer the opportunity to split your check among several different accounts. This is beneficial when trying to save for something because you never have to “see” or even move the money. Also, because this happens automatically you get used to living without that amount each month. You can also increase it as your income increases or just leave it for years. Adding this to the normal savings account option could help you save twice. A keep the change program or roll over extra cents through your bank can also help you save. Basically, programs like this round up your purchase – every purchase – to the next dollar and that change can be put into another account. Currently, I think I’ll be changing this so it moves to one of our kids’ accounts. Plans like a 529 or Roth IRA off investment options to save for college. Think of these as 401k-type plans for college savings. I currently have a Roth IRA for my retirement but it’s good to know it could be an option for saving for school too. Maybe you can’t afford to save each month for your children and that’s completely understandable with the rising costs of everything. However, when you receive your tax return you might have some extra money you can invest. Even if you only once a year, it can still add up by the time kids are 18. These accounts are similar to 529 and Roth IRA plans but they limit the amount you can contribute to $2,000 per year. And you can only add to them until the beneficiary is 18-years-old. 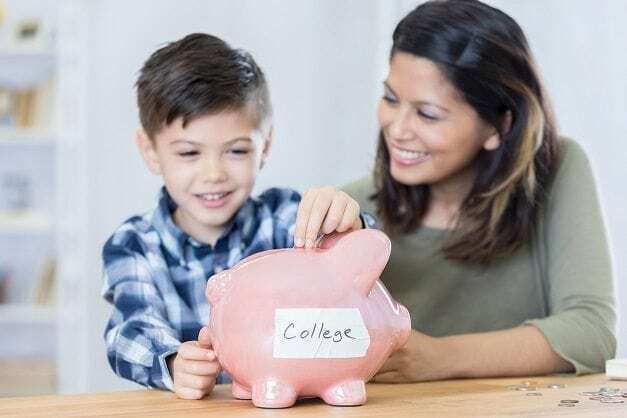 When you child gets their first job explain to them that a portion of their earnings will go towards their college savings – no matter what kind of plan you go with. Make it a set amount or a percentage based on their job. This will not only teach them that their education is also their responsibility but it will help them learn to budget. They can also continue to do this through college. As I say this I know I’m already behind. We were good about doing this for my daughter but we have not been as good about it for my son. Since I’m not currently working (or at least working in a way that allows us to plan accordingly) saving for them in general has become a problem. However, it’s never too late to start and you can always add a little more to the amount when it’s affordable to help alleviate any gap. No matter how you’re saving for college you need to be realistic about the money. You can’t save $200 a month per kid if you don’t have it to spare and if it puts other priorities in jeopardy. Maybe you can only afford $50 a month. Realize that’s still something and even small amounts of money can add up to pay for things like books or room and board. You can use a combination of the ideas mentioned above to get you to the end dollar goal. Using a bit of this and a little of that can add up to a lot of money that can be put toward an education. How are you saving for higher education? Or if you’re not tell me why below. 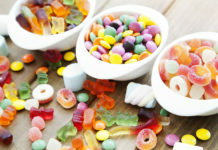 See the mistakes parents make when saving here and more ways to cut daily costs to save money here. These are great savings tips. I am really worried because college is already so expensive and I can’t even imagine how much more so by the time my own kids go. Great post! I have always struggled with saving for ANYTHING, but with 3 kids I know it’s a priority. Luckily I married an amazing man who also happens to be a finance whiz. Enter in 3 529 plans and we’re on our way to helping them get through college debt free. Thanks for sharing! I think paying for your kids’ college education is one of the greatest gifts you can give them! That’s our plan too! These tips would have been wonderful 17 years ago when the son was born. But definitely going o implements some of them now. Better late then bever. These are all great ideas! My daughter is a freshman in college this year, and it’s more expensive then I thought. Thankfully she qualifies for a chunk of money from financial aid, but still had to pay a little out of pocket. These are such wonderful tips! I had no idea how fast time would fly and we would be sitting in our living room discussing college plans. WHAAAA!! College is so expensive now. It is important to save as soon as possible. This is so important! My parents told me I was on my own and I made it through one semester before I dropped out. I’m still paying on that! I’d love to save for my son and am definitely behind…Thanks for the reminder! My husband and I were both able to graduate college with no debt, mostly due to scholarships and careful money management. It was such a blessing that we’ve already started saving for our daughters so that they can have that blessing too. Great tips! My husband has been saving for our kids their whole lives. It is coming soon for one and I hope we can get her through without loans. These are all great ideas for parents. We have a 529 account for our son. We started it when he was little and now that he is twelve he already has a good amount saved up for college. We are very happy with it! I feel so behind on this, so your post came as a good reminder to kickstart some of these things early next year. Looking to do more esp. #1 and #5! These are great tips and definitely something to think about! It’s really important for us that our daughter goes to college! With college getting more and more expensive, it’s important to try and save for your kids’ future. Thanks for sharing these tips. This is what my parents have taught me as early as I can remember. It’s definitely important to save. These tips will help you achieve that! I am still paying off my college loans 13 years later, only 7 more years to go! Naturally, I am scared that my children will end up in this same trap! Great tips, thank you! Great information! A little goes a long way! I think parents think they need to save for the WHOLE thing. Save all you can, but it is ok for your student to find ways to help themselves. I think it is important to start saving early. We are saving for our 2 now, and probably going to do the Florida Pre-paid plan for them like my parents did for me. Totally inspired!!!!! Such a great post. I’m going to be adding these in when teaching our kids about savings!! These are great tips. I am still paying off student loans and will be for a long time so it’s definitely something I need to consider for my own children! this is such an important post! College is so expensive and as a parent you want to do everything you can to help your child. I need to share this with my oldest. He’s only in grade 9 but I think he would benefit from seeing this and start thinking about it now! College is so expensive these days that you really have to start saving as early as you can and in a multitude of ways. No one wants their kids to have to utilize student loans if they don’t have to so saving up now is key. I saved as soon as I learned I was pregnant with my first born. It’s really important that you have a budget plan that works for you so you won’t have an issue with saving money! 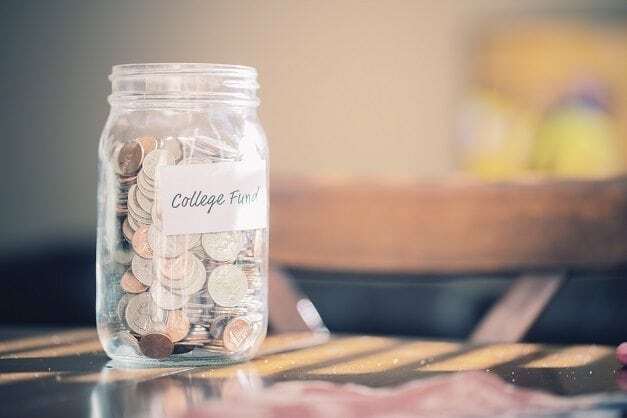 These are great ways to save for college. I am going to have to save this for future reference. These are some really helpful tips! We could definitely be doing more on this front. Thanks for sharing! 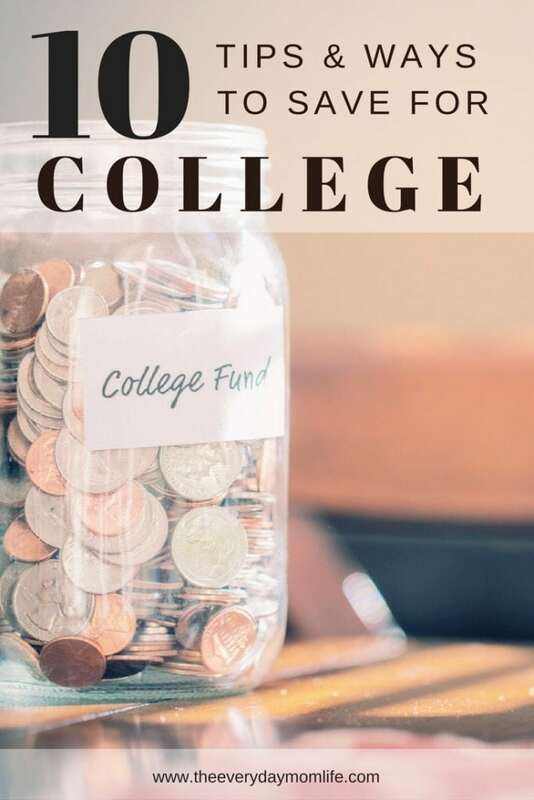 My husband and I definitely want to help out when it comes times for our kids to go to college, but at the same time, we are not planning on paying for all of it. We both had to make our own way and it taught us a lot about financial responsibility. Thankfully, we didn’t have to take out much in the way of loans and what we did, we paid off quickly after graduating. But I definitely agree with starting early and encouraging our kids to add to their own savings account! I love all your tips! College savings feels like such a daunting task but I know how important it is! I need to start now! Excellent ideas! College is just so expensive and necessary! My daughter is only eight and every cash gift she has ever received goes directly into her college savings. She’ll thank us for this one day! It’s great to be able to save for your child’s education if you possibly can and these are some hreat tips. A little each month soon adds up! You have so many good tips here. I have started 529’s for both my boys but I think adding our tax refund is an awesome option.